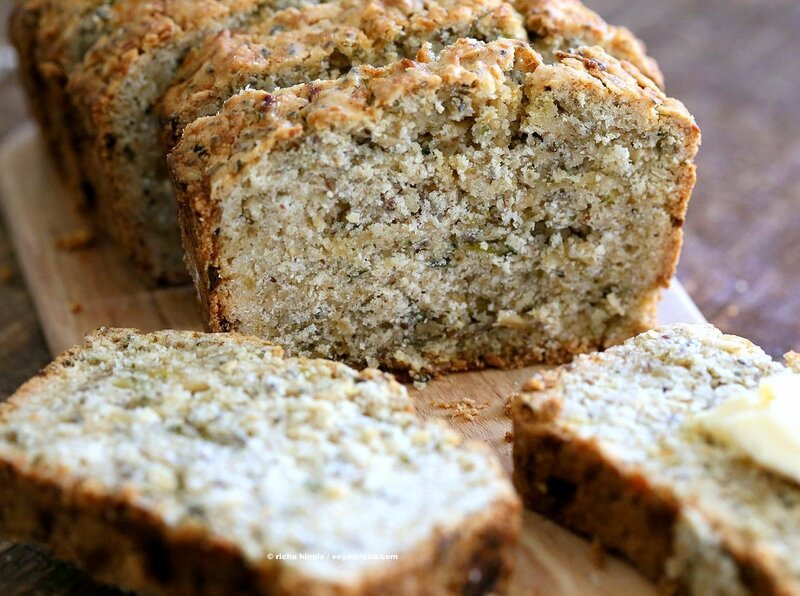 Vegan Gluten free Zucchini Bread Recipe. 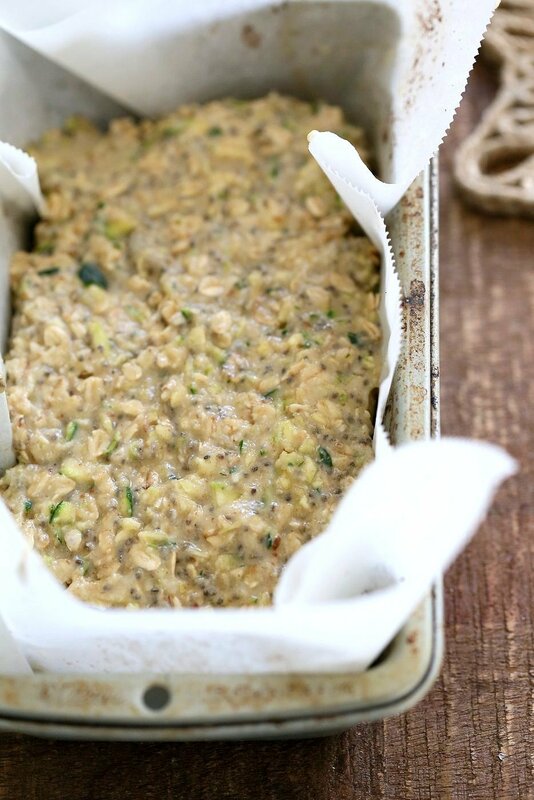 Moist, soft Zucchini Bread loaded with Oats, Chia seeds, Zucchini. Vegan Gluten-free gum-free Soy-free Recipe. Pin this post. Gluten-free baking can be tricky and even more so when vegan. There is no egg to support the baked structure. So the onus of holding the structure falls on the starches gums, flax/chia/psyllium and other ingredients. GF baking also might not work well by changing a non gf recipe with a 1 on 1 substitution. Most often you will want to use a combination of flours and starches and also evaluate the recipe. Cupcakes and muffins are easier to substitute when using a premixed all purpose gluten-free blend, but with larger loafs, the loaf will fall or not cook through the center or end up gummy or overly crumbly and dry depending on the ingredients used. 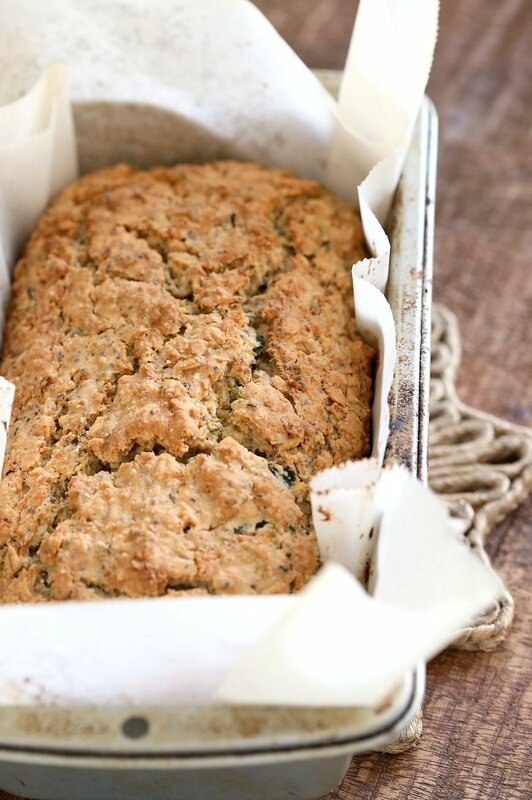 It takes many trials and lessons along the way to get to a good gluten-free baked quick bread. 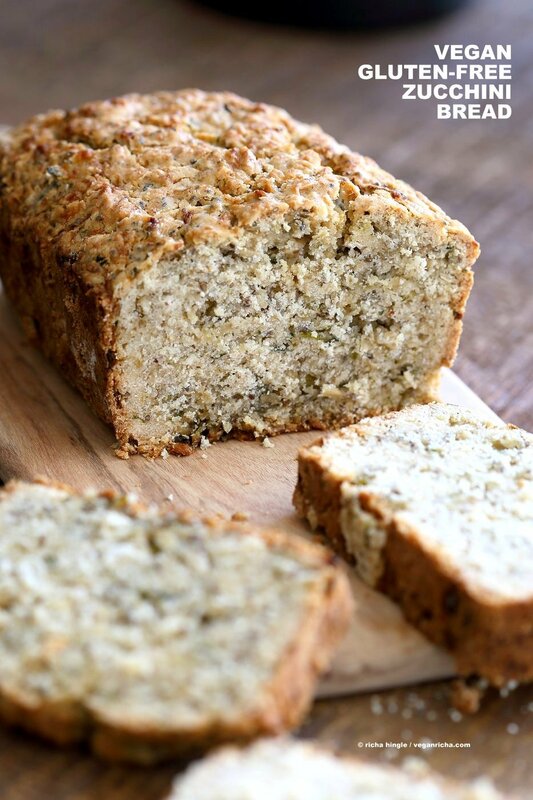 For this gluten free Zucchini bread I use almond flour, whole oats and chia seeds to add that bulk and volume that will hold the bread structure. There are no gums in this bread. You can use 1/2 tsp xanthan for more rise of the loaf. 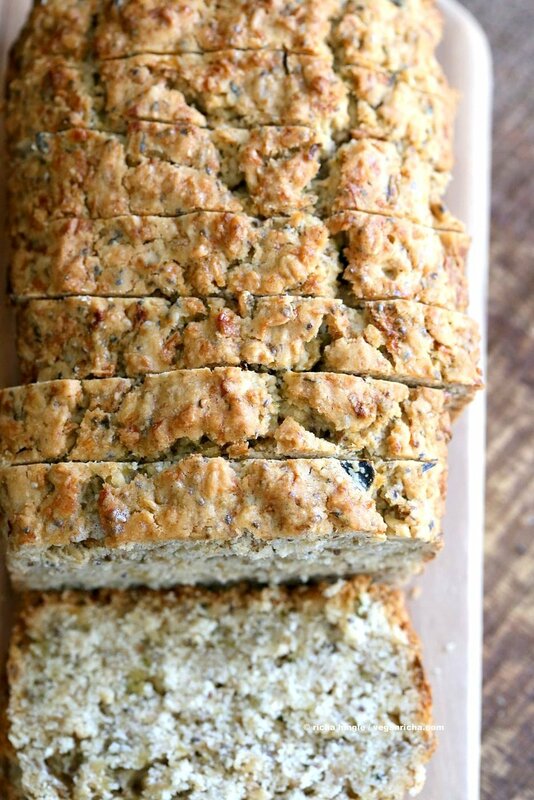 This loaf is full of zucchini, is moist and makes an amazing breakfast bread. Serve warmed with vegan butter or Glaze with your favorite glaze. The chia and zucchini are soaked for some time to allow the chia seeds to absorb some of the liquid and the zucchini to leak as much liquid as it can. This helps make the chia seeds less crunchy and the batter more predictable. Make this with any other shredded veggie or fruit. If you make it, tag me and let me know how it turned out! Soak the zucchini, chia and sugar mixture for an hour. Add flours and oats and mix in. the batter should be a thick batter. Drop into parchment lined pan. Even it out using a spatula. Top with chopped nuts or seeds if you like. Bake until a toothpick from the center comes out almost clean. Cool for 15 mins in the pan, then on the cooling rack. Brush vegan butter on top to soften the crust. I usually refrigerate the bread for a few minutes before slicing for cleaner slices. Grate the zucchini and add to a large bowl. Add the rest of the wet ingredients and mix well until the sugar dissolves in. Chill the mixture for half an hour. Fold in the oats into the bowl and chill for another 10 minutes. Preheat the oven to 365 degrees F / 180ºc. Line a 8.5 by 4.5 inch loaf pan with parchment or grease it well. In a bowl, whisk the rest of the dry ingredients really well. Add it to the wet bowl and fold in well. The batter should be thick. if the batter is too flowy, add in a tbsp or so more rice flour. Drop this thick mixture into parchment lined pan. Even it out using a spatula. Top with chopped nuts or seeds or a crumb at this point. Bake for 50 to 55 minutes or until a toothpick from the center comes out almost clean. Cool in the pan for 10 minutes, then remove from the pan and cool completely. Brush oil or melted vegan butter on top to keep the crust soft. Slice and serve warm with vegan butter. I usually refrigerate the loaf for 10-15 mins before slicing. Use other shredded veggies or fruits of choice for variation. Bake the mixture into muffins. Bake at 375 degrees F for 25 to 30 minutes. Toast the oats for 3 to 4 minutes on a skillet over medium heat. Cool and use for nuttier flavor. This looks great! Any idea if I could use tapioca starch in place of the potato starch? And brown rice flour, instead of white? You can use brown rice flour. For the starch potato starch helps with the volume. you can use a mix of starches(corn or arrowroot, tapioca) instead of all tapioca. Yes, you can use whole wheat flour. You can use all 1.5 cups of wheat flour instead of oat flour, almond, rice flour and starches. Mix in half of the flour and add more 2 tbsp at a time to make a thick batter. Wheat flour absorbs the liquid differently, so you will need less total flour than the total dry ingredients. How would I substitute a gluten free all purpose mixture ? Sub for the flours and starches? yes, start with 1.5 cups and add more if needed. Can I leave out the oil or do I need to replace it with something? Yes you can omit the oil. i would use nut or seed butter instead. Hi Richa, I am very happy for this bread recipe. Have you ever tried using wild rice flour? havent tried it yet. I think texture wise it should be similar to brown rice flour, but flavor and color might be different. Hi Richa, great recipe! Are there alternatives to both potato and tapioca starch? no. you can sub one of them, but not both with the same starch. You could try arrowroot for the potato and I have actually had success replacing tapioca starch with sweet rice flour. Looks yummy! Is it possible to leave our the potato and tapioca starch? Or does it need a substitution? I am interested in purchasing your cookbook today but have realised you have a couple different covers and wanted to know if the recipes are the same In both books? Yes, they are the same book. If it says “Vegan Richa’s Indian kitchen” that is the book. The print cover is as you see on the blog. Some online listings might have a different cover as that was kept till the final cover was decided. I’m so glad I discovered your blog! I’ve always been a bit hesitant to bake GF bread, but I’m going to have to try this! I find that gluten free baking is tricky if you don’t have a good vision of flour ratios! Coconut flour is really good, but it is so thick that you really don’t need a lot of it, for instance. But I know that you’re a master, Richa, so you never fail to make something amazing! This looks delicious! However, I have an oat allergy (along with being gf) and wondered if there are subs that may work for the whole oats and oat flour? Thank you SO much for the reply, Richa! I bought your book a few months back and have been making so many of your recipes. My boyfriend and I (and even non-vegan friends and neighbors) have just raved over every one of them. I appreciate the work you’ve put into each recipe and check your website often for new treats! yay! i am so happy to hear that!! For this recipe, if you do try it with those subs, make the batter into muffins. If the muffins rise well and retain their texture and crumb well, then you can try a loaf next. Hi I just used your recipe as a base and have read questions similar to what I had to do. Just in case someone has all of my allergies too this is what I did: I have allergies to rice, oats, almonds and potato. 3/4 c quinoa flakes mixed in with the flours, subbed the oat flour and white rice flour with quinoa and sorghum subbed the potato with cassava flour subbed the tapioca starch with arrowroot, subbed the almond with buckwheat and added 1 tablespoon of psyllium powder to help with the rising lessened the chai seeds to 1 tablespoon. I also added 1/4 tsp of baking soda mixed with 1/4 tsp lemon juice after my wet ingredients was set to add volume. I used date sugar and added nutmeg and ginger for a little extra spice and slightly more salt. Could I substitute flax seeds for chia seeds? I’d like to try this asap as my tastebuds are longing for this recipe! Thanks so much – I absolutely adore your recipes! I have a lot of sensitivities and find your recipes such a joy to work with and usually if one ingredients is not doable for me, there is an easy substitute. And thanks for getting back to me so quickly 🙂 I tried with grated carrot first since I’ve had so many disasters with zucchini but the batter was waaaaaay too dry as zuke is quite a bit more wet. How much liquid would you add to the carrot version? I added too much I think as the bread was a mass of goo and therefore had to be thrown out. With the cost of almonds so high I don’t want to make too many more mistakes 🙂 I then tried the zucchini version (the initial version) and the bread barely rose (not like in the photo above) so I was wondering if you could help me understand what I did wrong as I followed the recipe exactly but used flax seeds ground instead of chia seeds. Thanks so much! GF vegan baking is a tough one. I usually have 3 out of 5 success rate and have to salvage 1 or 2 from weird states. 🙂 For the gummy ones, I usually slice them thin and dehydrate at low heat in the oven to make crisp biscotti type stuff for anything that I know tastes decent and I don’t want to waste it. Here are a few rules I follow while baking gf. 1. The consistency is key for gf baking. whenever I make a change(or even if its the same recipe, it can behave differently), i add about 3/4 of the dry into the wet and note the consistency. I add more a little at a time to make the mix. 2. too dry batter will bake to a dryer baked result. too wet a batter will most likely fall after rising and be gooey. I prefer keeping the batter on the dryer side when I am not sure. As I can always add a moist glaze later if the baked result is dry. 3. If the mixture is too dense/dry and you want to add some more liquid, direct liquid will not work. it just doesnt incorporate well when added later. You want to add 1 or 2 flax egg or a chia egg instead. 4. Depending on the mood of everything, gf baked goods generally rise much less than regular baking. As long as the texture is ok, you did good. Did the zucchini bread have a good texture? Hi Richa Thanks so much for your reply – I missed it as for some reason nothing is reaching my inbox – but that’s ok…I remembered this am to check your site. Re the zuke bread …I’m dehydrating some of it though threw out most before I read this 🙁 ..yes the texture was good it just was a gooey mess so …looking at your 4 rules ….the batter was too wet. Though I think working with zuke is a challenge since it’s hard to know how wet is too wet and how dry is too dry (that is squeeze out too much water). 🙂 yes, vegan baking with wheat is also almost always 5 out of 5. its gf vegan that is quite tricky. I don’t squeeze the zucchini. The 1 hour time for the chia seeds to hydrate should make a gel-ish kind of mixture of the wet. Also, if it is gooey from the middle, but has baked some close to the edges, then bake longer. the pan and oven matter, so sometimes its just about baking another 10-15 minutes. Another thing you can do is to bake it into muffins. Bake 2 muffins and see how they turn out. if they rise well, are not gooey etc. Then you can adjust the batter before the next batch. Baking a loaf is much more difficult to get right compared to baking muffins. I am trying to turn gluten free & vegan to improve on my health. Here, in India, it is difficult to find most of the gluten free vegan grocery. Also, have been losing heart due to lack of recipes. Chanced upon your blog and realised that I could do a lot with the help of your recipes. I have an excellent oven to bake in. In cereals I have a choice of Millets’ flour, Cornflour, Amaranth flour, Buckwheat flour, and Water-Chestnut flour. Do you think these can be used for baking breads? Yes you can use those to bake gf vegan recipes. There are some gf recipes on the blog you can try. You can substitute the oat flour or sorghum flour in the recipes with millet, amaranth or water chestnut flour and keep the rest the same if possible. I often use tapioca and potato starch. You can use a combination or cornstarch and arrowroot starch. What can I use in place of almond flour? We are gluten and nut free here due to allergies. no almonds would be tricky in this loaf. 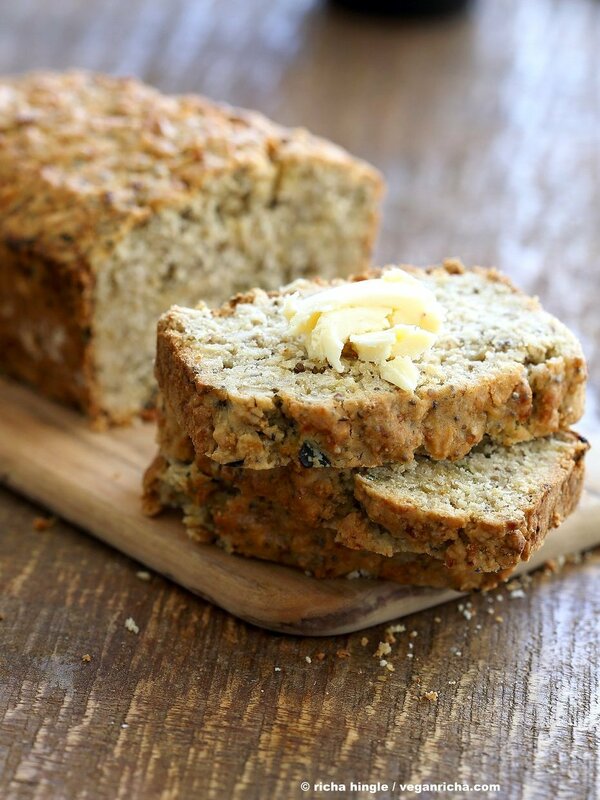 Try it with pumpkin seed or sunflower seed meal, but bake it into muffins. Bake 2-3 muffins to check if they bake well and the texture and flavor works for you, so that you can adjust the batter before baking the rest of the batch. Bake for 30 to 35 mins. (add some cocoa for chocolatey bread, add more vanilla or zest etc for flavor). Can I leave out the vinegar? If not what can I add instead? Thank you for sharing your recipies. Hi! The almond and oats flour have to be store bought or I can make these at home and use? you can make them at home. For oat flour, blend oats in a blender in 1 minute cycles until finely ground. For almond flour, put raw almonds in a blender a tbsp of flour or starch. Pulse a few times to break into smaller pieces, then blend in 1 minute cycle, then let the blender cool for 5 mins and blend again. Hi Richa, could i possibly use quick oats instead of old fashioned oats. Thanks a lot for your awesome recipes. Looking forward to making this bread. Thanks for the lovely recipe Richa. I’ve made it as is, just increased the rice flour to 1/2 cup and added cranberries for a bit of colour. I top it with fresh grated zucchini and the bread looks (and tastes) soo yum. Thanks for another great recipe. Never had Zucchini Bread before but this is so delicious that I made it for the second time today. Again, I used sunflower seeds instead of the almonds and it tastes very well. My partner can’t eat oats so I froze half of the loaf and will do this again. Really looking forward to your second book by the way. Hi Richa, first of all thank you for all your gf recipes, they are amazing. I have been making your zucchini and pumpkin breads and following the recipe to the T. Even adding guar gum 1/2 tsp to be sure. However each time at least 3-4 slices crumble. Is it because the batter is dry? I do add 1/4 cup of soya milk to the batter. Do you think that milk is the reason? Will adding more oil help? Could you please help. Can you elaborate of how they crumble? Do they crumble when you are slicing? The bread just after breaking has a harder crust that might crack on slicing. Brush with a little oil, Cool it completely, chill for an hour or so and then try slicing. Also, use a very sharp knife. Check on a tomato, if it doesnt slice the tomato easily without squishing it, its not sharp. hmm hard to say why that is happening. maybe the loaf is getting overbaked? how is the texture overall. is it a moist loaf like a regular cake like loaf? I add 1/2 cup brown rice flour instead of 1/4. But also add 1/4cup soy milk. You think that might be the reason. I also use a combination of corn and tapioca starch as I can’t find potato starch easily. Do you think coconut flour will work. More of the almond flour becomes a bit pricey. This was delicious! Thank you for the tip to make them into muffins. My toddler begged for one every time he opened the fridge (so about twenty times a day). I added walnuts to the mix and a few on top, which made these the perfect breakfast food for every member of the family. Absolutely love the recipe! i will make it this weekend for sure!